If you have any question about laser vein therapy and its suitability for you, please telephone the office at (416) 510-0100 or contact us to reserve time for your personal, complimentary consultation. The Cutera CoolGlide Xeo™ laser coagulates the hemoglobin molecules within the tiny vessels and allows the body to reabsorb them. The precise laser beam treats only the targeted spider veins with a specially designed headpiece that leaves the surrounding tissue intact. 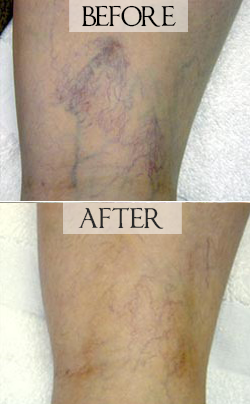 Treatments usually take up to several minutes depending upon the number of veins to be treated. Following the treatment there is usually no downtime and patients can return to their daily routine without interruption. More than one treatment may be necessary depending upon the number, size, and color of the veins.